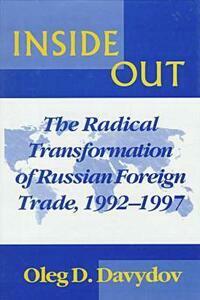 Oleg Davydov's Inside Out examines Russia's foreign economic relations from 1992 to 1997, a period of drastic change and transformation. During these years, as it underwent the change from state monopoly to free market, Russia's economy was rebuilt and the very principles of foreign trade redefined. After 1992, both industrial and agricultural enterprises in Russia were unchained and received the right to trade freely without any permission from "the top." Davydov studies the changing role of the government in Russia's economy as it actively searches for new markets and seeks to integrate Russia's economy into the world's. These economic reforms, Davydov proposes, should result in the integration of the Commonwealth member countries, Russia's admittance into the WTO, and the creation of a free trade zone with the EC, all of which will provide tremendous opportunities for Russia as it embarks on the road of a sustained and democratic development.